Thank you for visiting another one of Apple Sales and Leasing Four Points's online listings! 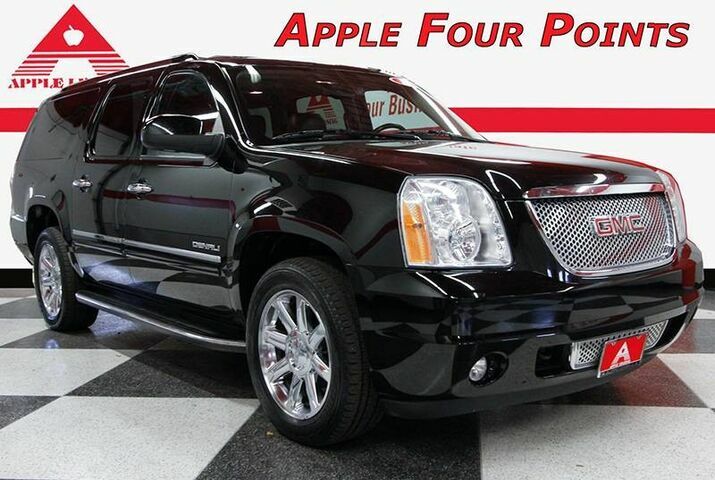 Please continue for more information on this 2014 GMC Yukon XL Denali with 112,194mi. Your buying risks are reduced thanks to a CARFAX BuyBack Guarantee. The CARFAX report shows this GMC Yukon XL is a well cared for One-Owner vehicle. This versatile SUV is perfect for families or contractors with its oversized cargo area, exceptional horsepower and option upgrades. Indulge yourself with one of the most highly crafted, most luxurious automobiles available today. Put away your phone and focus on the road, your new vehicle has navigation. Engineered with the latest in technology and features, this vehicle is an automobile lover's dream. Seats front bucket with leather-appointed seating 10-way power driver and front passenger seat adjusters on SLT and 12-way power driver and front passenger seat adjuster on Denali including power lumbar control power recline heated seat cushion and seatbacks 2-position driver memory adjustable head restraints storage pockets and floor console.